Hang loose and eat like a beach side local with these delicious Pacific Rim staples! Truly a cuisine of medleys, Pacific Rim cooking combines foods and cooking styles from countries that border the Pacific Ocean such as California, Hawaii, Japan and eastern Asia. Introduce your young chef to unique ingredients and typical meals shared among friends and family. They’ll be bringing home a meal to share and will be excited to recreate these tasty delights at home or on your next Airbnb tropical destination! Exploring the Pacific Rim Kids Class Series 11-17 yrs. Exploring the Pacific Rim Kids Class Series 6-9yrs. *By purchasing this package for your student, you are enrolling them in the full 5-week class series session from 4/24-5/22. Hang loose and eat like a beach-side local with these delicious Pacific Rim staples! Truly a cuisine of medleys, Pacific Rim cooking combines foods and cooking styles from countries that border the Pacific Ocean such as California, Hawaii, Japan and eastern Asia. 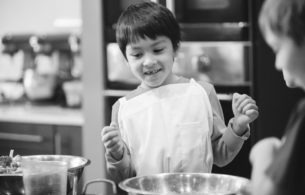 Introduce your young chef to unique ingredients and typical meals shared among friends and family. They’ll be ready to share and recreate these tasty delights at home or on your next Airbnb tropical destination! Sample menu items could include dishes such as Teriyaki Chicken, Veggie Fried Rice, Coconut Shrimp, Banana Cherry Custard Muffins, Korean Short Rib Tacos, Chicken Lettuce Wraps, Chow Mein, or Mango Sticky Rice. Exploring the Pacific Rim, Littles Class Series 3-5yrs. *By purchasing this package for your student, you are enrolling them in the full 5-week class series session from 4/27-5/25. Show your loved ones all month long how much they mean to you through FOOD! Allow your junior chef to whisk you away with some classic sweet V-day treats and savory restaurant favorites during the month of love. 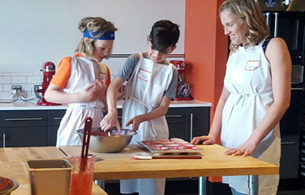 Everyone, whether you’re the one doing the cooking or eating, will be showered with all the good feels as your student learns tips and tricks throughout the class series to help them become a better cook in the kitchen and YOU get to share the love! Sample menu items could include dishes such as Onigiri Japanese Rice Balls, Green Tea Cookies, California Club Pizza Bites, Haupia Coconut Squares, Mochi Cupcakes, Aloha Fried Rice, Churro Muffins, or Yakitori Beef Skewers.